Place flour, sugar and salt in a food processor and pulse to combine. Add solid coconut oil and pulse until crumbly. Pulse in water until dough holds together. Place dough on a lightly floured surface and shape into a ball. Roll dough into a large circle and place in your pie pie. Bake 12-15 minutes or until golden brown. Remove and let cool. 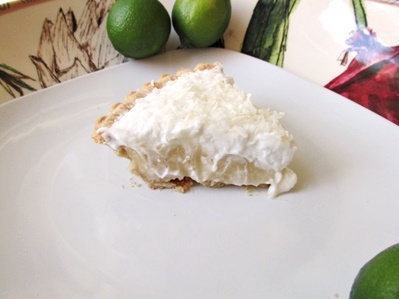 Spread coconut evenly over a baking sheet. Bake, stirring often until golden brown, about 5 minutes. In a medium saucepan, combine cream of coconut, coconut milk creamer, eggs, sugar, flour and salt and mix well. Bring to a boil over low heat stirring constantly. Remove the pan from the heat and stir in ¾ cup of the toasted coconut and the vanilla extract. Pour the filling into the pre baked pie crust and chill until firm, about 4 hours. Combine all ingredients in a mixing bowl and mix on high until thick and creamy. Spread on top of the pie filling and top with remaining toasted coconut.